We’d love your help. Let us know what’s wrong with this preview of The Challenge of Easter by N.T. Wright. Why do we celebrate Easter? Lost among the colored eggs and chocolate candies is Easter's bold, almost unbelievable claim: Jesus has risen from the dead, and now everything is different. In this excerpt from The Challenge of Jesus, takes a step back from the hoopla surrounding Easter to look at it in its earliest context, where we see a band of followers discovering the ful Why do we celebrate Easter? Lost among the colored eggs and chocolate candies is Easter's bold, almost unbelievable claim: Jesus has risen from the dead, and now everything is different. In this excerpt from The Challenge of Jesus, takes a step back from the hoopla surrounding Easter to look at it in its earliest context, where we see a band of followers discovering the fulfillment of all the promises God had made to their people over the centuries, and pronouncing a new era that unsettled their friends and scandalized their oppressors. That era extends to our day, where to celebrate Easter is to receive an invitation to live as though God is among us, making everything new. To ask other readers questions about The Challenge of Easter, please sign up. I've almost memorized it. It's that good. Wright was able to affirm my lifetime of appreciation for the rescue from a doomed eternity, Christ brought through His life, death, burial and resurrection, while at the same time expand my imagination to the way that resurrection changes my perspective in the here and now. His premise is that the resurrection enlivens us in the here and now, teaches us a new way to be human. To be kingdom-announcers in this present day. More of this review at my blog: h I've almost memorized it. It's that good. Wright was able to affirm my lifetime of appreciation for the rescue from a doomed eternity, Christ brought through His life, death, burial and resurrection, while at the same time expand my imagination to the way that resurrection changes my perspective in the here and now. His premise is that the resurrection enlivens us in the here and now, teaches us a new way to be human. To be kingdom-announcers in this present day. "The Challenge of Easter" was written by a New Testament historian who's also a bishop (in the Eastern Orthodox Church, I think). This book is more for professing Christians than unbelievers. The author assumed the reader would agree with him and so didn't give much actual evidence to back up his claims. He mainly focused on how the Jewish disciples of Jesus would have viewed his resurrection and how they would have understood the phrase "the kingdom of God." Referring to the Bible (mainly 1 Cori "The Challenge of Easter" was written by a New Testament historian who's also a bishop (in the Eastern Orthodox Church, I think). This book is more for professing Christians than unbelievers. The author assumed the reader would agree with him and so didn't give much actual evidence to back up his claims. He mainly focused on how the Jewish disciples of Jesus would have viewed his resurrection and how they would have understood the phrase "the kingdom of God." Referring to the Bible (mainly 1 Corinthians 15), he showed that they really were claiming that Jesus died, came to life again, and had a physical body after his resurrection. He had some ideas that I've never heard before but appear to be Bible-based, so it made me think. The writing was also a bit formal and got technical at times. The last chapter didn't make much sense to me and most of it didn't seem related to the Resurrection. It seemed to be about how we can apply the early Christian understanding of the kingdom of God to our lives today. He may have been referring to some Catholic teachings, as he clearly did so once without explaining what he meant. Since I'm a Protestant, this may have been the source of my confusion. However, I do know that some of what he said in this chapter went counter to clear teachings of the Bible. People interested in Jewish messianic expectations in Jesus time would probably find reading this book worthwhile. Otherwise, "More Than a Carpenter" by Josh & Sean McDowell covered much of this same information in a more thorough, easy to understand fashion, so I'd recommend reading that instead. As Easter approaches, the perfect little resource to equip yourself to have an intelligent conversation about human history's most significant event is now available. Adapted from N.T. 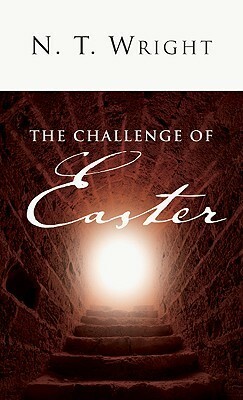 Wright's the Challenge of Jesus, the Challenge of Easter is a quick read at only 62 pages long. If you have an hour and a half to put into boning up on the historical facts surrounding the resurrection of Jesus of Nazareth, this book is for you. Wright makes the case that the church would never have existed if Chri As Easter approaches, the perfect little resource to equip yourself to have an intelligent conversation about human history's most significant event is now available. Adapted from N.T. Wright's the Challenge of Jesus, the Challenge of Easter is a quick read at only 62 pages long. If you have an hour and a half to put into boning up on the historical facts surrounding the resurrection of Jesus of Nazareth, this book is for you. Wright makes the case that the church would never have existed if Christ's resurrection were not a fact. "We better learn to take seriously the witness of the entire early church, that Jesus of Nazareth was raised bodily to a new sort of life, three days after his execution." Alternative theories about Jesus's fulfilled prophecy about himself being raised from the dead have been discussed, debunked, buried, and themselves resurrected and recycled for the past two millennia. In sixty-two pages, Wright not only strengthens the resolve of believers by affirming their faith and giving them the tools to boldly converse about Christ, he politely and respectfully punches holes in the arguments of skeptics. If you are unfamiliar with Wright's writings, this is a great book to cut your teeth on. This was a just a teaser as far as I'm concerned. The length of this one may be a plus to some but I think it comes with a price. The short length (62 pages) and brevity of the book doesn't allow Wright to dive as deep into the claims made nor does it give the reader the chance to experience the level of engagement that I believe Wright offers in other books. I would recommend reading Simply Christian or Surprised By Hope rather than this one. More of a pamphlet than a book, but excellent. Very good intro into some of NT Wrights writings. Even though this a small book it has so many powerful moments for its readers to reflect on. “We live, therefore, between Easter and the consummation, following Jesus Christ in the power of the Spirit and commissioned to be for the world what he was for Israel, bringing God's redemptive reshaping to our world. Christians have always found it difficult to understand and articulate this, and have regularly distorted the picture in one direction or the other.